WTI crude is back in the neighborhood of $52.50/b. A strong rally on Friday brought prices above $53, but prices are fading this morning. The overall impact is that prices are close to where they began last week. 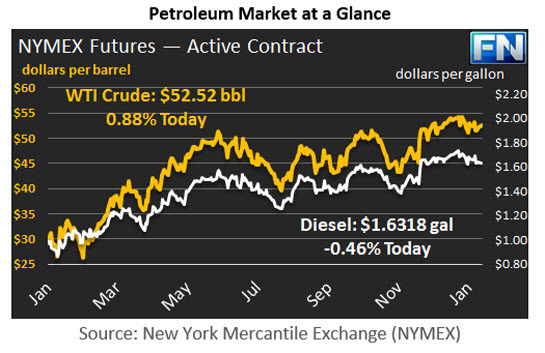 WTI opened at $53.33/b today, up $1.88 from Friday’s opening price. 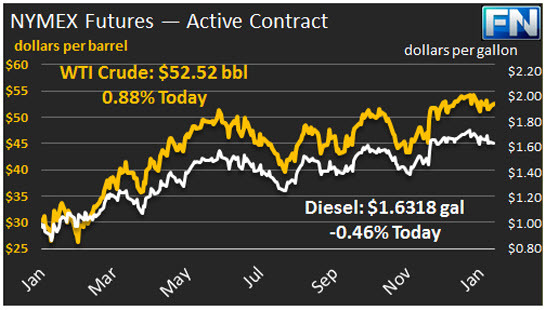 Current prices are $52.52/b, down $0.70 cents from Friday’s close. The OPEC/Non-OPEC Monitoring Committee met in Vienna over the weekend. The committee is made up of the oil ministers from Kuwait, Venezuela, Oman, Algeria, and Russia. Kuwaiti Oil Minister Essam Al-Marzouk is the committee chairman. The group made highly positive comments about the level of compliance so far. The Saudi Oil Minister announced that the group had cut 1.5 mmbpd of the 1.8 mmbpd pledged. The Russian Energy Minister announced that Russia had cut 0.1 mmbpd of its pledged 0.3 mmbpd. The supportive nature of this news is being partially counterbalanced by indications of increasing supply in the U.S. The U.S active rig count jumped by 35 last week. Our second article today discusses the restoration and rebounding trend in U.S. oil rigs from January 1991 to January 2017. Distillate opened at $1.6361/gallon in today’s session, up 1.64 cents from Friday’s opening. Current prices have subsided to $1.6318/gallon, down by 1.41 cents from Friday’s close. RBOB opened at $1.5645/gallon today, up 1.9 cents from Friday’s opening. Prices are currently $1.5499/gallon, down 1.61 cents from Friday’s close.